Brain fog is one of those catch-all phrases that can describe a lot of different issues, all with their own causes and symptoms. The best way to help yourself regain clarity is to figure out what your brain fog feels like and what might be the root cause. When it comes to our herbal helpers, there’s a lot that can be done to increase your level of clear-headedness. Let’s start by looking at potential causes of mental fog and then we can chat about what herbs might help you out with your symptoms or even get at the heart of the issue. Your brain uses about 20 percent of your body’s energy when you’re resting. If you’re spending time solving the world’s problems (or a sudoku), it can use even more than that. The idea behind brain fog is that there is something going on with the body that is forcing the brain to focus on solving an internal problem rather than this week’s NYTimes crossword. Lack of restful sleep – If you’re not getting good sleep, your thoughts probably aren’t super clear. Working really hard to stay awake isn’t a good use of all that brainpower. Dehydration – Not drinking enough water can cause all sorts of issues. Brain fog is one of the first symptoms you might notice. I’ve said it before and I’ll say it again – drink water. Stress – If your adrenals are running like crazy and you are pulled in a bunch of different directions, it’s natural that you won’t be on top of your game. Food – Processed food and greasy food can cause brain fog over time because your body is spending more time digesting it and getting cleansing than it is helping you think. Environmental toxicity – These are things like air pollution, heavy metal contaminants, and chemicals in the environment. If you are subjected to this in your environment, it could be causing or contributing to your fog. Other health issues – If this is a chronic problem and you just can’t figure it out, it might be caused by other health issues. Your body is using your energy to heal and not enough energy is left over to help you think clearly. Chat with a holistic practitioner about this and any other seemingly unrelated symptoms that you might be having. Need a boost? From helping your memory to improving circulation to increasing your ability to work through stress, herbal allies can be really helpful for keeping your mind clear and focused. Along with being one of our favorite culinary herbs, rosemary has been known as “the herb of remembrance” for hundreds of years. Historically, people wore rosemary around their heads when studying and then again when taking exams because scent is so closely tied to memory. It’s also a mild parasympathomimetic (say that 4 times fast), which means that it helps your body regulate your nervous system so that you stay in “rest and digest” and not “fight or flight” mode when you’re resting—because it’s easier to stay clear and make decisions when you’re calm. This is good for people who are dealing with memory loss and maybe some anxiety along with that (plus it’s delicious, so adding it to your dinner plate is a good idea). This is the classic herb for mental clarity. It is most commonly used for the elderly suffering from various types of dementias and confusion. What it actually does is increase the circulation to your peripheral nerves—meaning it helps your body pump more fresh blood to your brain, and it stimulates the release of neurotransmitters—meaning that it helps your brain communicate better. These two things, in conjunction with its anti-inflammatory and antihistamine properties, are really helpful for mental clarity. You all probably know by now that mugwort is one of my very best herbal allies… Because I talk about her all the time. Just knowing that mugwort is helpful for digestion and headaches tells us that she is wonderful for brain clarity as well—especially if your brain fog is caused by something going on in your digestive system. The most common folklore around mugwort is that she brings clarity to your life through dreams. Known for bringing restful sleep, she helps you have deeper REM and stay there longer. As a flower essence, mugwort is wonderful for moving out stuck ideas and bringing clarity and understanding to situations. Brain fog be gone! 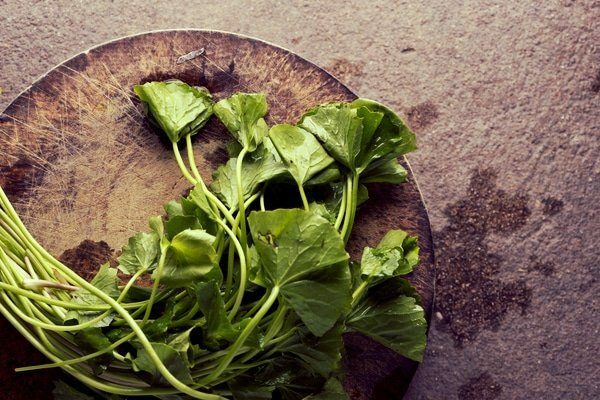 It’s said that eating two gotu kola leaves a day keeps senility away! Gotu Kola helps to increase connectivity between the brain and the body, and helps with left to right brain energy movement. This is good for brain fog that’s coupled with anxiety or digestive issues. Since it’s also a vasotonic and it builds and protects connective tissue throughout the body, gotu kola is a good herb to give to people that have a hard time building muscle. Ashwagandha is a powerful adaptogen that helps the body deal with stress physically and emotionally. Brain clarity isn’t specifically listed in any book that I have read about it, but it is a consistent side effect that I hear about from people who use this herb daily. It gives you the physical strength to power through the day while subtly working on your ability to think through the problems that you face without concern or fog. This is good for brain fog brought on by too much stress and being pulled in too many directions. Note: while the herbs on this list are generally considered safe, overuse of any herb can lead to negative effects. Make sure that you spend time researching the medicines that you take and how they might interact with your body or with other medicines that you’re using. What helps you combat brain fog? Let us know in the comments! I was diagnosed five years ago at the age of 51. I had symptoms for 3-4 years prior to that but did not know anything about Parkinson’s. I first noticed a slight twitch in my left hand, finger and thumb, which became pill rolling. We attended a lot of sports events and I would lose my balance in the moving crowd. I then started seeing a neurologist. I started falling a lot when losing my balance and had a hard time walking normal. I finally froze up in the doorway at church. I told my Neuro and he said that I had Parkinson’s. Started me on entacapone,levodopa, carbidopa, and pramipexole and I still didn’t feel or get better January 2017 my neurologist and I decided to go with natural treatment and was introduced to Green House Herbal Clinic natural Parkinson’s disease Herbal formula, i had a total decline of symptoms with this Parkinson’s Herbal formula treatment. I enjoyed reading your article and I have been into natural healing for most of my life. I have digestive issues and anxiety. I am always interested in trying something new in hopes that I find something that truely helps me. Can you recommend something that has the herbs you listed in the product? I love herbs and turn to them often. BUT since it turned out that wheat/gluten sensitivity is causing the brain fog I was in an uphill battle until I eliminated that food. Now I have a new life, now that I can think! Do you have recommendation for dry skin – ? I have “dry patch” specifically on my back, and can’t get rid of it . 2. Exfoliate your back using sugar, salt, or a scrub brush. 3. After showering, moisturize your back using our Coconut Body Oil, or another moisturizer you love. Actually I have depleted andrenals. I have been taking ashwandganda for about a year now and I still have brain fog. I have felt that I am hypothyroid for many many years and every time I take blood tests it shows I’m fine so the doctors say there is nothing wrong with my thyroid. Have you tried either bitter kola or kola nut? Works like magic. And by the way try the actual nuts not supplement. Thank me later. I can’t state enough that what one eats drastically influences wellness…including brain fog! I had brain fog. Then, I listened to what my body doesn’t like to process (e.g. cow dairy, modern processed glutinous wheat flours, sugar), and voila, less or NO brain fog. 🙂 Oh, good sleep helps, too. *thumbs up* Aubrey, you are awesome!